Maillol’s wife was the model for Femme Assise. The piece evokes a sense of tranquillity and repose. Comparing it to his later works which were reduced to simplified volumes, Femme Assise is relatively naturalistic. The woman depicted is sat down with an earth bound movement which is well balanced with a focus on hand placement and weight distribution. Interestingly, Maillol was a very versatile artist: a painter, tapestry designer and illustrator, but after1900 he concentrated on sculpture, where he remained prolific. 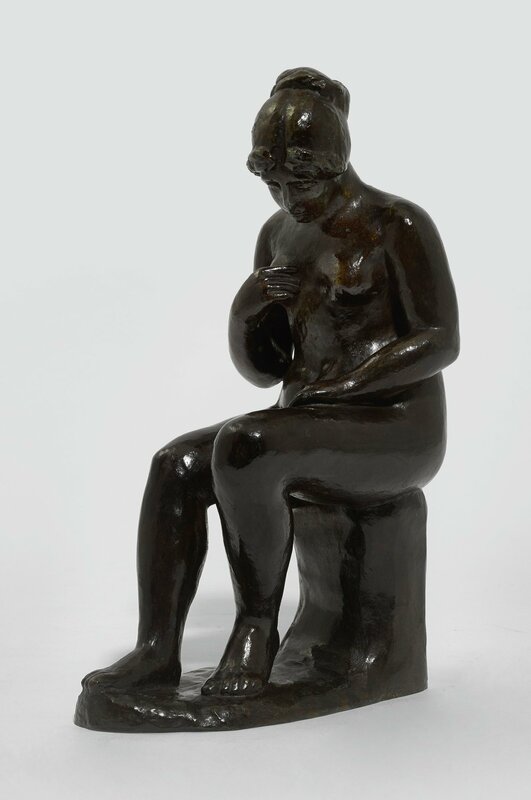 Maillol’s subjects where predominantly female nudes, and Femme Assise is a perfect example of a sculpture of this subject conceived during this period. Aristide Maillol began to sculpt relatively late in life, he was already in his forties. By that time, he had struggled with his artistry for twenty years under hardship and poverty. 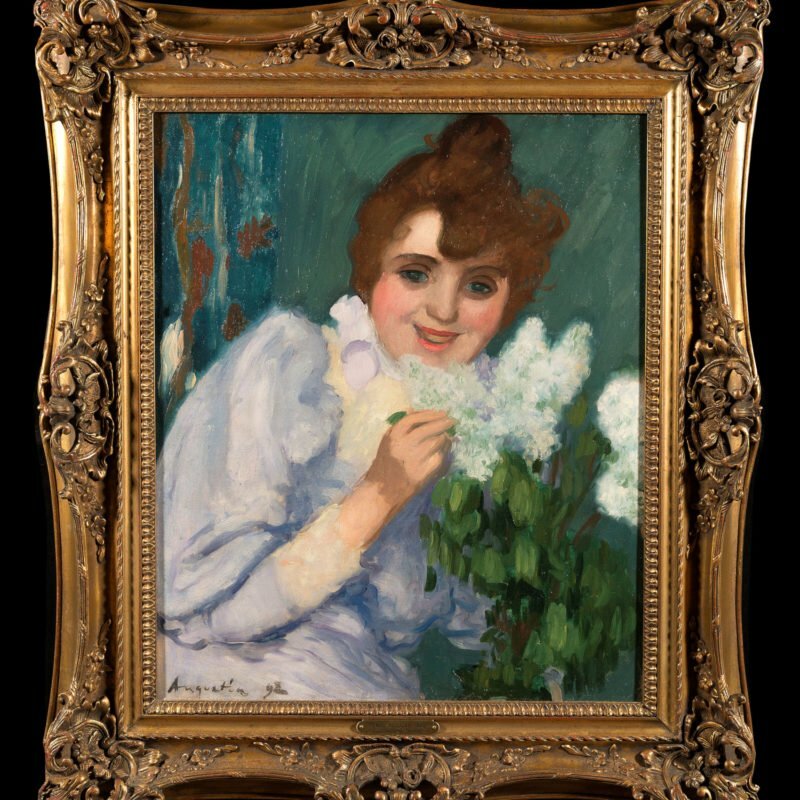 As a young man, he took several attempts before he was admitted to the École des Beaux-Arts. His passion was painting but found no success in this area. In the 1890s he became acquainted with Paul Gauguin who came to have a great importance for Maillol as an artist. With Gauguin’s encouragement, he began to create imagery that aroused appreciation and he could even use some of the work for some of the work. Just as the success seemed close, he suffered from temporary visual impairment, which was probably caused by over-effort. This forced him to abandon the image weave in favor of the more tactile three-dimensional creation. Although he had previously only sporadically studied sculpture and basically only possessed elementary knowledge, he quickly found in his sculpture his own unique way of expression. Amazingly, a mature and full-fledged artistry emerged. Within a couple of years he had developed the motif that came to occupy him during the rest of his life – the female body in various variations. The 19th century sculpture tradition was largely based on realism with a great measure of narration, which also included the use of metaphors, symbols and attributes. At the turn of the century, Auguste Rodin was the dominant sculptor. His powerful work is characterized by twisted, almost embarrassed forms and can be considered as a combination of two of the great currents of that time, realism and symbolism. Most young sculptors during the late 19th century were under the influence of his art and teachings. Perhaps Maillol’s distinctive art had not found its distinctive character if he, as a young man, applied to the sculpture as a means of expression and thus possibly also ended up in Rodin’s doctrine. Maillol’s simplified, static sculptures completely broke in the 19th century. With their silent, closed massive shapes, they defy all attempts at interpretation. His goal was that art would not be descriptive or use metaphors, but rather represent a quest for simplification of forms to express the synthesis of the object. Maillol died in 1944 in the suites after a car accident. He was 83 years old and had been active in many artistic branches, such as painting, carving, pottery, book illustration and image weaving. However, it is as a sculptor he made the deepest impression in art history. He performed several public assignments and eventually won both national and international fame. Aristides Maillol’s renewal of the art of sculpture creates a synthesis between ancient human art and the future abstract art. His sculptures thus became an intersection that connects the beginning of art with its future promise.